ChIP-sequencing, also known as ChIP-seq, is a method used primarily to determine how transcription factors and other chromatin-associated proteins influence phenotype-affecting mechanisms. Determining how proteins interact with DNA to regulate gene expression is essential for fully understanding many biological processes and disease states. ChIP-seq combines chromatin immunoprecipitation (ChIP) with massively parallel DNA sequencing to identify the binding sites of DNA-associated proteins. High quality library preparation is key to a successful ChIP-seq experiment. 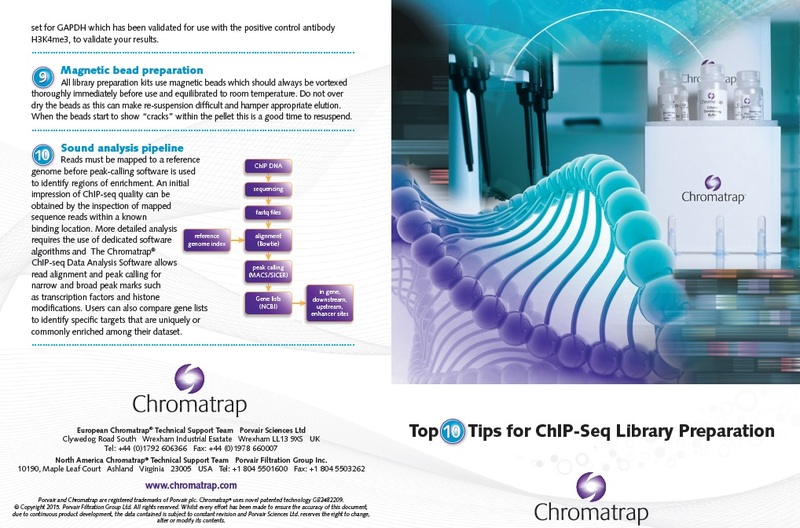 Written by scientists with many years’ experience of ChIP assay development, the new document provides an informative 10-point illustrated guide to help you improve your ChIP-seq library preparation.